DOMESTIC VIOLENCE TOOK MY STRENGTH. I RACE TO GET IT BACK. Today I went to court. Shaking uncontrollably and barely able to breathe, I read a prepared statement about my husband’s violent and abusive behavior—how he threatened suicide with a loaded handgun if I left him, how he once handed me that handgun and told me I should shoot him with it and claim it was self-defense, how during fights he would punch his giant metal gun safe until his fingers bled. I have been through hell these past few years, trying desperately to save that marriage and the tortured person I am married to. What I have to show for that monumental effort, aside from the credit card debt I racked up while he controlled our finances, is PTSD. I feel the effects acutely while I’m running. I have run alone my whole life, but now I’m afraid to. Ever since the hearing where his lawyer browbeat me and insinuated that I’m lying—the same hearing where the judge lifted my restraining order against my husband—my hyper-vigilance sends me often into tailspin. When I attempt to run alone, I risk a panic attack. One day I’d talked myself down from a couple minor episodes and made it about four miles out when a third panic attack sent me scrambling into the woods for cover. When I attempted to begin walking back, I collapsed on the sidewalk, hyperventilating. I was so incapacitated that I had to let a stranger drive me back to my friend’s house. Today’s hearing granted my husband his weapons—and his concealed carry permit. I don’t know what my story is yet—it’s not what I’ve done already, because what I’ve done has only delivered me to a place where I wake my friend in the other room when I wake up screaming from nightmares of my husband attacking me in the dark. So far, my story has included keeping quiet when I’ve felt frightened. It has included over-functioning to prove my worth. It has included the belief that I could heal someone who doesn’t want to heal. But now I am writing a new story. This time I am asking for help. I am dissolving my shame by speaking my truth. I am keeping my first attention on myself, and I am honoring my needs to feel safe and loved and seen for the whole of who I am-fear and power, shame, and courage. I feel my power most resonantly in two arenas of my life. 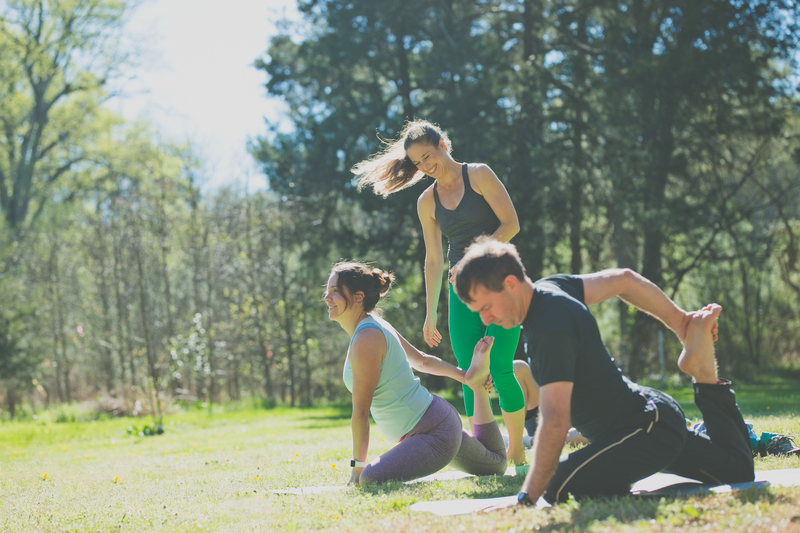 I am a yoga teacher, and I am powerful when I am teaching. As my students arrive for class, my fear and hyper-vigilance relax. I feel like myself again—a natural leader and healer. I am centered and present with my students, happy. Then there’s Spartan. When I’m racing, I feel powerful. I am entirely present, completely inhabiting my body. I feel fast and strong and invincible—and happy. I’ve been running Sprints since 2012, and last year I had this intuition that my first Trifecta was going to do something important for me. My racing season gave me enough glimpses of myself at my best to shake me out of the daze of hopelessness that my marriage had worn me down to. At the end of it, I wept with pride as I held my World Championship qualifier coin. My first race of 2017 is in three days. I wish I could claim confidently that I’ll win the race or dominate all the obstacles. The truth is that I’m writing this story as a pep talk to save my soul, which feels crushed under the weight of fear and hopelessness. The truth is that I’m in bed in the middle of the day in my bathrobe, not sure how to go on. But I have an amazing season planned. It includes Spartan Race World Championships, and after that race I’m going to run the NYC Marathon on the fundraising team for the Center Against Domestic Violence. The money I’m raising for that marathon funds programming that will teach other young people how to see and respond to early warning signs of abuse in their relationships. Helping others do better than I did gives me hope. This morning I sobbed to my court advocate that I don’t want to spend the rest of my life in fear. She told me that she doesn’t see that for me, and this season I’m racing so she doesn’t have to. This season, as I train and race, I am practicing being present—with my big, challenging emotions and with the loving friends who show up to train with me. This season I am practicing being supported—by my protective loved ones who are escorting me to every race. This season I am practicing asking for help—from everyone around me on this fundraising goal that feels like my mission of growth. Most of all, this season I am practicing being brave—by telling my ugly, painful story and dissolving its power over me, by changing all the parts of myself that allowed the abuse to happen and continue, by turning toward myself and the world around me for healing. “Fall down seven times, stand up eight” is one of my favorite aphorisms. My name is Laura Nickerson. I am a survivor of domestic violence, I am a Spartan, and I am working to stand back up. Laura Nickerson lives in North Carolina. 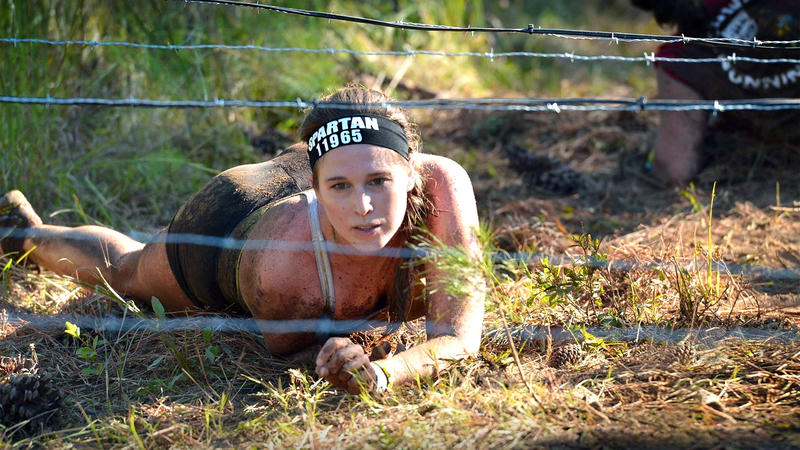 She’s a yoga teacher and a Spartan. 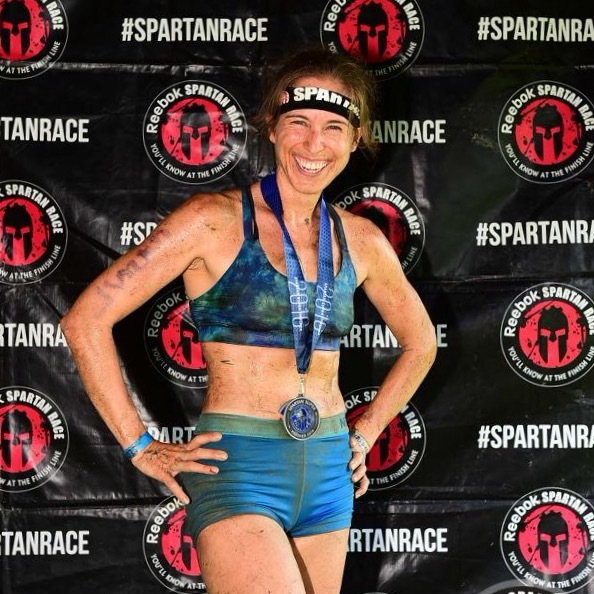 At the beginning of June, she ran her first Spartan race of 2017. She qualified for the World Championship in California. Support her TCS NYC Marathon campaign.